Did you know that 1 in 10 Asian Americans suffer from hepatitis B? Probably not, which is why B Here is here. 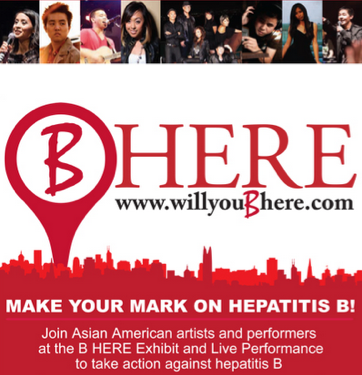 B Here, as you’ve hopefully heard, is a new campaign designed to raise awareness of hepatitis B, a life-threatening liver disease that affects up to 2 million people in the U.S. – many of whom are Asian Americans. Eek factor: 10% of infected people can develop chronic hepatitis, cirrhosis or hardening of the liver, or liver cancer. Not cool. We would like to kick diseases that affect our peeps in the shins. Join us in the effort! B Here is currently hosting a university tour that makes one more stop next week, with two performances at UC Davis on Tuesday, October 27 and Wednesday, October 28. If you’re in the area, pack them seats! It’s practically a parade of our favorite musicmakers, rumpshakers and funnypeople–from KevJumba (♥) to Kaba Modern to David Choi (The lineup’s so good you almost forget you’re learning about something!). Can’t go? Well, there are lots of different ways for you to spread the word. Help the peeps out.